Do I need an aquastat for indirect water tank? I just had an IBC boiler installed with an IBC indirect DHW tank. The tank came with a temperature probe that was wired into the boiler. The way the system is run is that dhw plus 2 pumps for 2 zones are run from the boiler directly. the other 6 zones are run from a taco zone relay box. Today, all of a sudden after talking with IBC tech support, my plumber said that the temp sensor is no good and i have to put in an aquastat for dhw. He did not have enough expertise to actually explain to me why this is necessary but he did say something about priority and /or safety. before I blow $ on an aquastat, can someone explain to me why this is the case? I thought that a temp probe is enough for the boiler to turn the dhw zone and and off as needed. I realize there may be a priority issue but I don't suspect it to be that large based on what i'm reading in the ibc manuals. 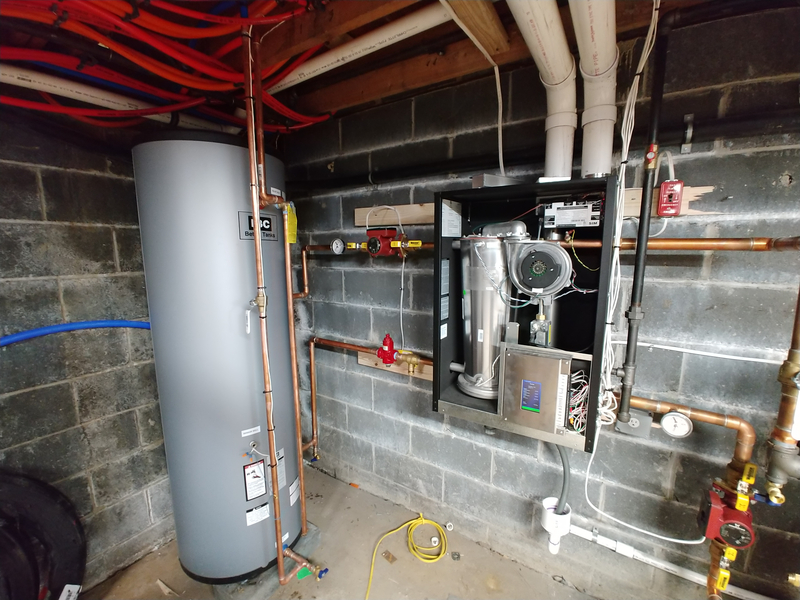 the boiler is a g3 20-160. the tank is a 65 gallon indirect IBC unit as well. I dont know where your located or what the codes are, but could it be they want a secondary high limit as an added safety? Some pics showing the wiring diagram would help. the sensor should be good enough...if not better than the aquastat. the sensor/ thermistor actually lets the boiler know what the temperature is in the tank and the boiler will ramp down as the set temperature gets closer. 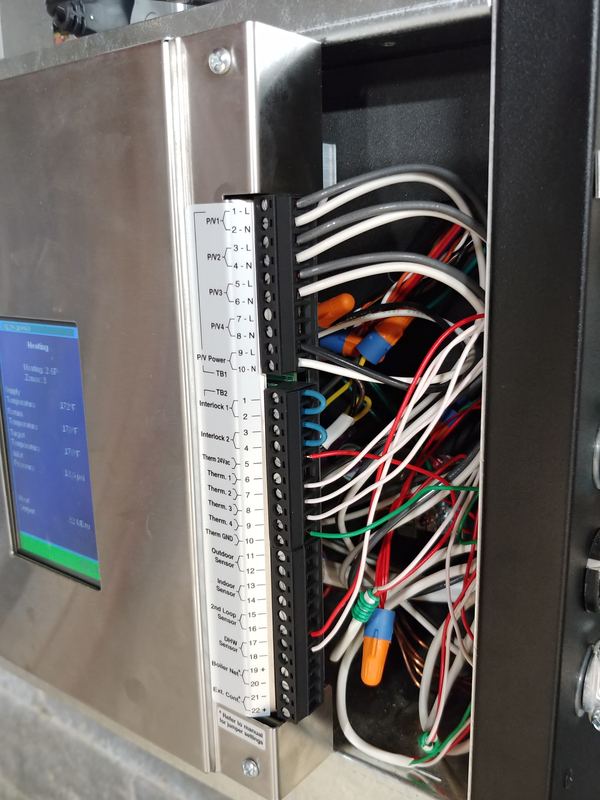 Your installer may not understand the wiring set up. There is a space in the G3 control for this. The IMC requires a tempering valve be installed to prevent scalding should a sensor or aquastat fail. Could it be that's what tech support was referring to? Either way, the sensor is more accurate and if properly connected and set right, the boiler should give priority to domestic. Kcopp is your man for this boiler. It may also be that the Taco is not giving priority by stoping the circs because the jumper is still installed between 120v "H" and "ZC". The "ZC" terminal needs to be fed from the boiler's output terminal for central heating circulator(s). The boiler will deactivate this terminal when there's a call for domestic. A picture of the piping would help. Sometimes installers that are not familiar with this control strategy, pipe the boiler in a manner that makes it impossible for boiler to control DHW. Here's the setup. When I took the photos, the probe was out of the tank and I re-inserted it after I took the photo of it out. Can you remove the cover from the Taco panel and take a pic? 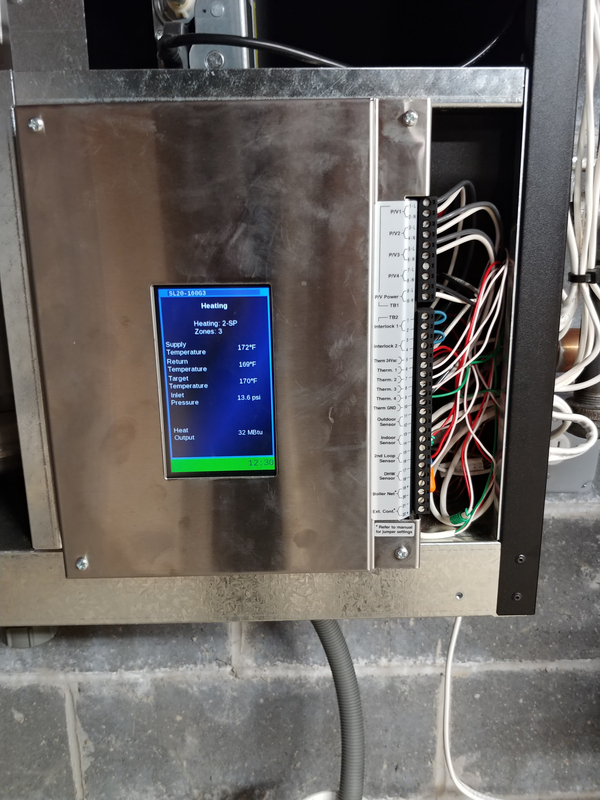 Also, the outdoor sensor needs to be installed and connected so the boiler can operate from its ODR curve. You're losing at least 15% efficiency with out it. The boiler essentially has a built in aquatat with similar setup parameters. As @Zman said, there could be something to the way the pumps are controlled that may make a aquatat work easier for your setup. 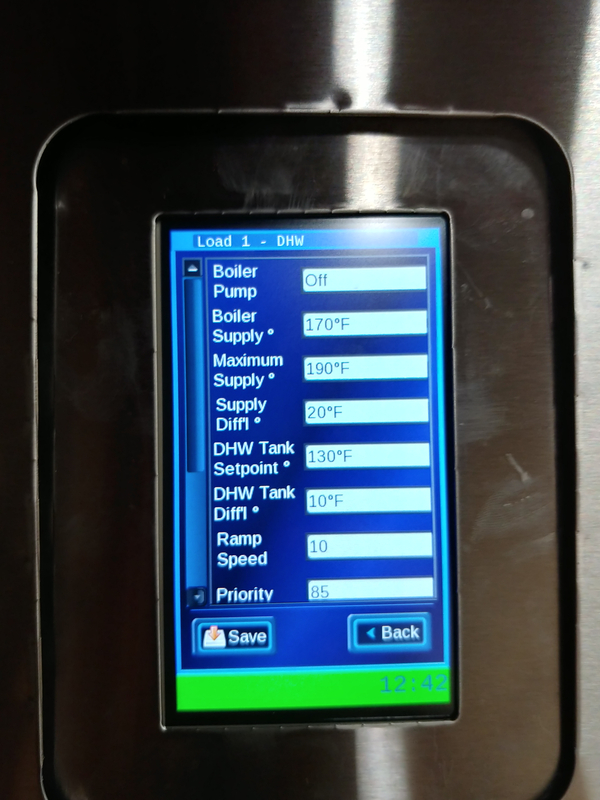 The IBC boiler controls are pretty good for built in boiler controls and have a lot of configurability. IBC has a lot of info on their public website that may be useful. You have an exceptionally high pump to BTU ratio. I also just noticed that there are flow control valves on both the supply and return of the house loop. They're not necessary and can actual cause an issue like that: when both of them close, they isolate the expansion tank from the boiler. 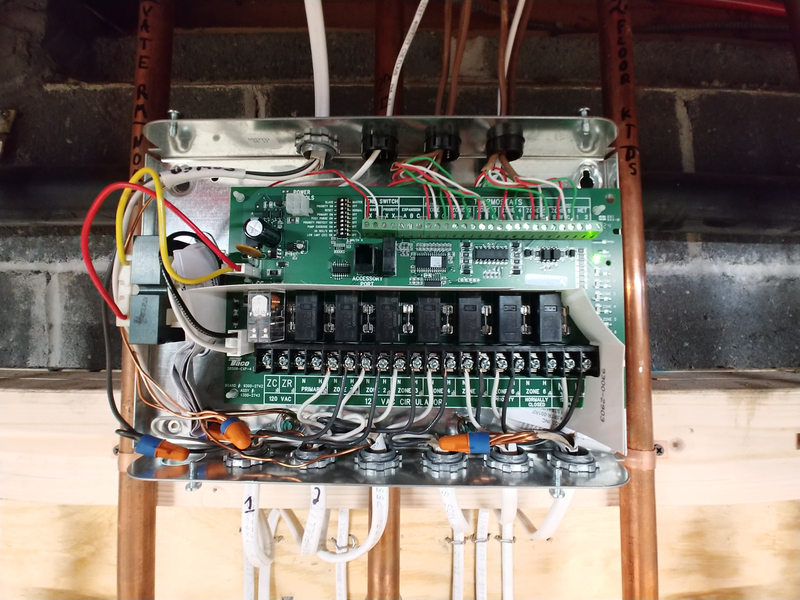 You should be able to wire the Indirect circ pump directly into the boiler control. The boiler will control that directly. You don't need to go to the Taco relay. If he is having difficulty contact the local rep they can help... Where is this? I can get the number for you. Thank you for all the comments. You guys are a little over my head. I'm attaching a pic of the Taco panel. @Ironman - can you elaborate on what you said about the control valves? which ones are they (sorry, noob) and what would the conditions have to be in order for them to trip? Also, which outdoor sensor does the IBC use? I found a part number on their site but it looks hard to find online. It looks like this may be a generic part so would any sensor work? @kcopp - take a look at the pictures and let me know if something's amiss. @SuperJ - the ratio you speak of - what should it be and where do you see it being high? what does it mean? 10 pumps? Wow... old school and big electric $$. > @SuperJ - the ratio you speak of - what should it be and where do you see it being high? what does it mean? What I mean, is that you will be using a lot of electricity to move the heat around, probably several hundred watts as @NY_Rob said. With a variable speed ECM pump and zone valves it would probably be below 50watts most of the time. But zoning with pumps is a time proven method (it just happens to be power hungry). I do like your neat, non spaced constrained install! 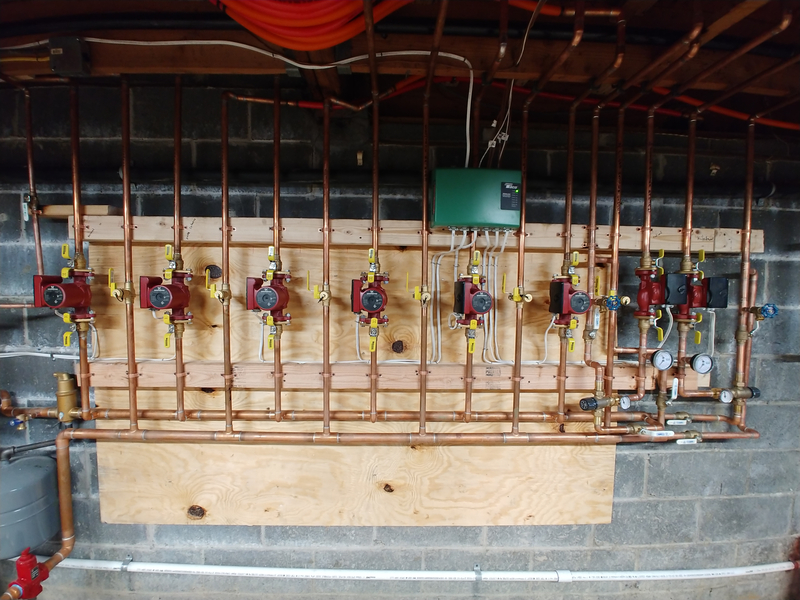 It seems like so many heating systems are crammed in a corner with a mess of pipes, pumps and wires. ^ I also like the Boiler Buddy buffer tank! Unfortunately, when you see a buffer tank installed you automatically think "short zones" which leads back to why all the pumps vs. one or two ECM pumps with zone valves. @fiddlermd, please realize I'm just critiquing your guy's design choices, not his workmanship and use of quality parts. For what he did... he did an excellent job. It could have been done differently for less $$ and less yearly cost to you. 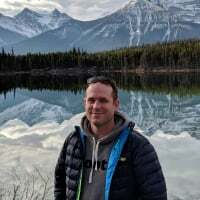 His design with so many pumps, use of gravity flow checks and his advice on the DHW tank sensor make me wonder if he's installed many mod-cons? Again, his workmanship is top notch! part of the issue is that the person putting together the package and the person installing are different. i am doing a whole-house reno so some plumbing was included, but after reading this forum, i decided on IBC.. so i had to find someone who carries it. I found a place in NY and explained to the person on the phone what my setup was. Yes, i do have a small zone (master bath with radiant) so he suggested the boiler buddy. the parts were delivered as suggested and my plumber took it from there. so is there anything i should change at this time to either increase efficiency or prevent future problems? At this point, the parts are already bought/paid for/installed and replacing them would probably cost more then you'd ever recoup in electricity savings by replacing them. Unless you have comfort issues, go with what you have. If you want to think of it in a non-heating way... it's like you purchased a Hummer just to tow a 700lb jetSki. The pump thing is probably a future opportunity. Make sure you install a boiler system sensor either in the tank or the secondary supply line. This will ensure the boiler modulates to the load. make sure you pay attention to zone flow rates, you can set the pump speed, and perhaps throttle some ball valves to get appropriate flow rates for each zone. Or you can use balancing valves to be more precise. Overpumping reduces efficiency by warming up your return. It may also make your boiler cycle more often due to depleting the tank faster. You also want to make sure your boiler is setup for a high mass load so avoid having the modulation hunting up and down. Make sure your primary pump speed is set to give about a 25F delta at max fire. Make sure your boiler pump shuts off when the buffer tank is satisfied, otherwise it will blend the tank cause the boiler to cycle more often. 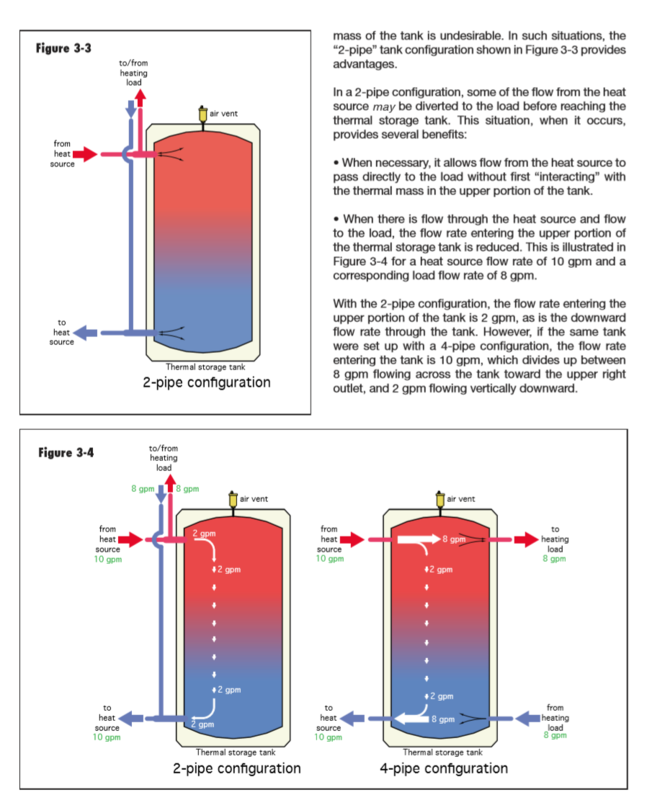 If you want to geek out a bit more... look into a 2 pipe setup for tank. It may not have a benefit in your case, but I think it's a slightly more elegant way to connect a boiler to a tank. I don't think it makes as much difference on high mass loads like infloor, so it likely isn't worth the rework. Once you're up and running tighten up your outdoor reset as much as possible to the point where you have constant heat calls, but still have good comfort. 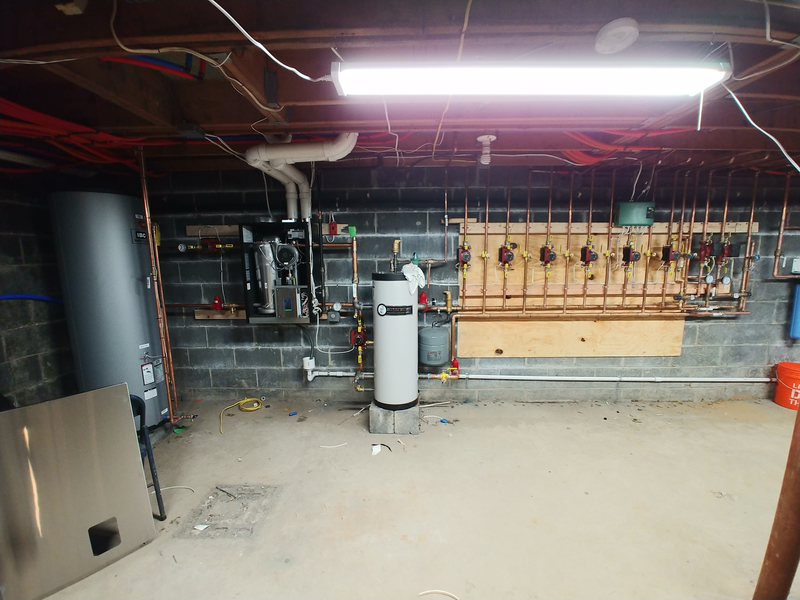 The indirect water heater. The Circ pump that goes to the tank. Does the wire go to the taco relay control OR does it go into the boiler? IMO it should go to the boiler. And the sensor should also go to just the boiler. So you should be fine. Unless he says he needs to add a mixing valve to the tank.... But he should have known that before he started. DHW Priority is just that... a DHW call has priority over spacehaeting, so while your boiler is producing 180F (or in your case 190F) water for the DHW indirect tank- spaceheating is disabled (pumps are turned off). 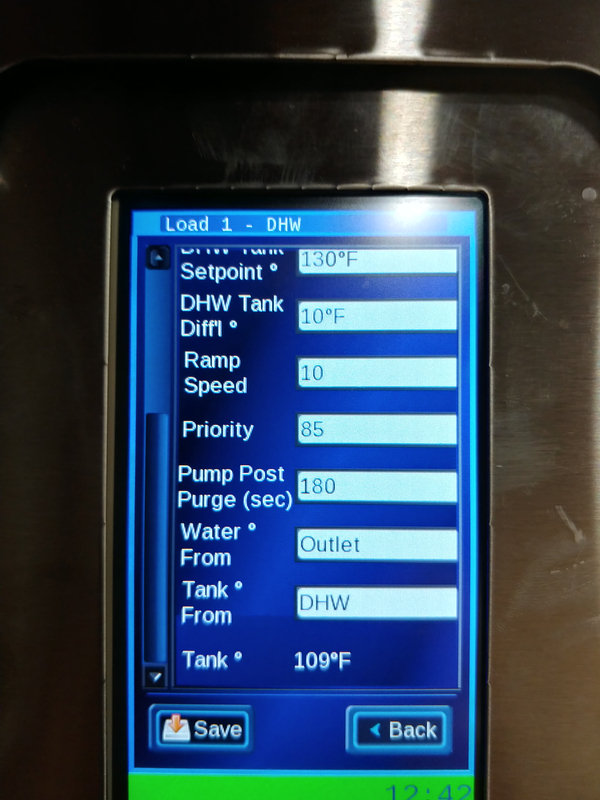 If it takes 15min to satisfy the DHW call plus 3min (according to the "180sec Pump Post Purge" in your photos) you have no spaceheating for 18min. You'll have to play with those settings for best comfort once your system is up and running, I don't see much benefit in post purge after DHW call... it's not going to make the indirect tank temp any higher and it's just holding off your spaceheating call even longer. The other benefit of no DHW Post Purge is that you get a nice shot of 180F water from the HX into your radiators that got cold sitting for 15+ min during the DHW call. You might want to crank the DHW max temp down from 190F to 180F max... you are exhausting through PVC in the end. I have mine set to 170F max, but I only have a 30gal indirect so even at 170F max it still satisfies the DHW calls in 10min. Nice boiler BTW... looks very simple and easy to work on... best of luck with it!